Betty was born October 2, 1922, on the family farm near Burnside, Illinois the daughter of Edward and Laura (Duffy) Weatherington. She was united in marriage to L.C. Comstock on August 16, 1950, at the Blandinsville Christian Church. 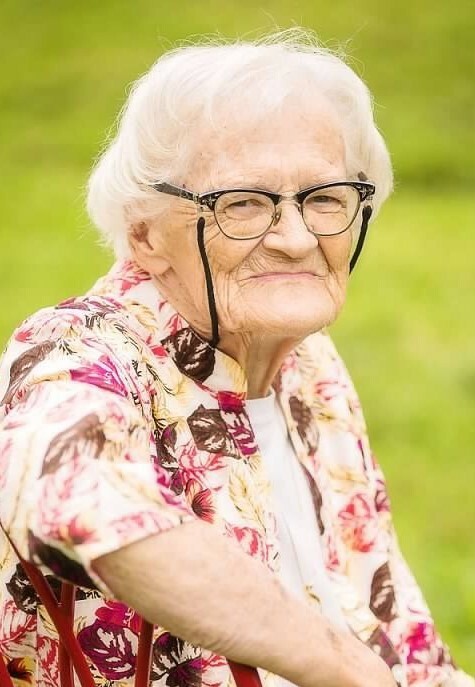 They moved to a farm near Burnside near her father and younger brothers whom she had been caring for since her mother passed away in November 1948. This is where L.C. passed away on May 15, 1982, after a lengthy illness of MS. She had also cared for many other members of her family. Betty is survived by two sons, Randall (Lora) Comstock of Alta Loma, California and Ronald (Beckie) Comstock of Havana, Illinois; one daughter, Suzanne (John Maguire) Comstock Boussaard of Macomb, Illinois; two step-daughters she raised as her own, Vicky Geissler of Menifee, California and Pam (Bud) Rhodes of LaGrande, Oregon. Her pride and joy were her grandchildren, Robin, Rick, Brian, Mark, Chad, Sarah, John, Lucretia and Mariska; thirteen great grandchildren, Ronnie, Megan, Nichole, Alexandra, Katie, Olivia, James, Olivia, Riley, Cole, Brevyn, Maddie and Brigham; six great great grandchildren, Khloe, Molly, Korbyn, Madelyn, Miranda and one due in November; and several nieces, nephews and cousins. She was preceded in death by her parents; husband, L.C. ; two brothers; one sister-in-law; one grandson, John Comstock; one nephew, Derek Weatherington ; two sons-in-law, Ron Geissler and Edward Boussaard. Betty had been a member of the Burnside Christian Church since August of 1936 where she played piano and organ for 30 years until she retired due to poor vision. She was recently attending the Central Christian Church in Havana. She attended a one-room schoolhouse for eight years. She walked the mile to school most of the time or rode a horse. Once she arrived at school she would turn the horse loose and it would walk back home. She attended Burnside High School two years. She transferred to Carthage High School for her Junior and Senior years and drove a car to school. She graduated with High Honors and scholarships in 1940. She spent most of her life on the farm helping the family. She was like a hired hand to her father as she helped him farm. She volunteered at church, school and “Back Closet” in Carthage and twenty years at a food pantry in her church. She enjoyed upholstering, sewing, crafts and helping others in various ways. In 1998 she moved to Havana to be near her family. In Havana she was very active with her church, the food pantry, walked three miles a day and assisted friends with activities. Most of all she enjoyed her family and friends even though they were scattered across the country. Funeral services will be held at 10:00 A.M. Monday, September 10, 2018, at the Burnside Christian Church with burial to follow in Moss Ridge Cemetery in Carthage. Visitation will be held from 4:00 – 6:00 P.M. Sunday afternoon at Printy Funeral Home in Carthage. Memorials may be directed to the Burnside Christian Church or the Havana Food Pantry at the Central Christian Church in Havana. A memorial service will be held in Havana at a later date. Printy Funeral Home of Carthage is in charge of arrangements.